Retro City Rampage DX, an all-new remastered version of the original 8-bit-inspired 2012 release Retro City Rampage by Vblank Entertainment, will have a special retail edition available only on PlayStation 4. The PS4 physical version of Retro City Rampage DX is limited to just 2,000 copies and is only available on the company’s official online store for $25. The limited edition can now be pre-ordered and will ship to buyers at some point in early December. The package comes with a Sega Master System-inspired Blu-ray disc, a rental store-style reversible cover, an unlock key for the PC and Steam version and a download of the game’s official soundtrack that features 32 songs. The downloadable version of Retro City Rampage DX on the PlayStation Store will release this Tuesday for the PS4, PlayStation 3 and PlayStation Vita at $9.99 and $7.99 during launch week for PlayStation Plus subscribers. Buying one version unlocks all three for PlayStation consoles as part of Sony’s Cross-Buy program. Brian Provinciano, the primary developer behind Vblank Entertainment, said on the PlayStation Blog the the physical version is entirely self-published and funded only by the independent Canadian studio. This is the first time Retro City Rampage has had a physical medium version. Provinciano said he always wanted to release a physical copy of his game. He chose to do it on PS4 because of Sony’s ability to help release both a physical and digital version with one build of Rampage DX, which meant he didn’t have to work on two different PS4 games. The disc version of Rampage DX won’t be Cross-Buy with the only two platforms and only includes the PS4 edition. It was revealed on the game’s Twitter account that Retro City Rampage DX only takes up around only 40 megabytes of the 25 gigabytes on a PS4 Blu-ray disc. The game is the rarest PlayStation 4 game ever printed due to its small quantity, according to Provinciano. The original Retro City Rampage will be removed from the PlayStation Store and replaced with the DX release to avoid confusing potential buyers, according to Provinciano. While Retro City Rampage will be delisted from the PlayStation Store, owners can redownload the original game at any time. Save files for the original Retro City Rampage can be transferred over to the new version on PlayStation platforms using Sony’s Cross-Save feature and the original game is included as part of the DX version. Retro City Rampage DX will also release Nov. 13 for Nintendo WiiWare and later this month on Xbox 360, PC and Mac as a free update to the original version of the game. It will be playable on the Wii U using the console’s Wii mode. Future buyers of the PC and Mac versions get both versions when buying on either platform. Retro City Rampage DX already released for the Nintendo 3DS eShop on Feb. 6. It will be the first time the game is available for the Xbox 360 and Wii in Australia and New Zealand. PlayStation owners of Retro City Rampage will not get a free update but instead have to buy the new DX version on all Sony platforms. 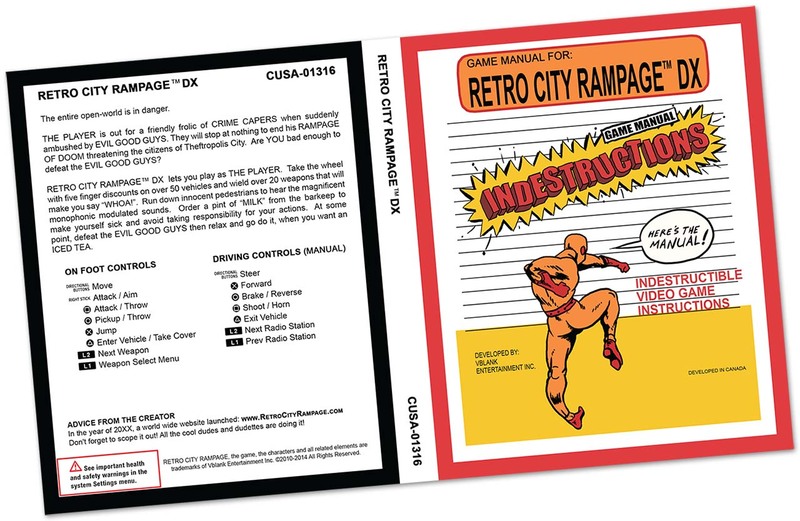 The new features in Retro City Rampage DX includes many changes to the original game. Tweaks to missions, a new heads-up display, gameplay balancing, updated controls, a new wanted level system, two different graphics modes, hijacking weapon trucks, new leaderboards and a new Trophy set on PlayStation platforms have all been added to Rampage DX. For full details on the changes, read this article on the PlayStation Blog or watch the launch trailer below. Retro City Rampage has a long development history. It began in 2002 as a game created with replicated NES hardware called Grand Theftendo that recreated Grand Theft Auto III in 8-bit form, which you can watch here. It gradually evolved into a full-fledged open world game of its own around 2005, heavily influenced by classic titles of the ’80s and early ’90s and featuring many references to that era. Originally announced as an exclusive for the Nintendo Wii as a WiiWare digital download that would launch near the end of 2010, Retro City Rampage first released digitally for the PS3, PS Vita and PC on Oct. 9, 2012. After several delays, Retro City released for WiiWare on Feb. 28 2013, long after all the other platforms. The game continued to receive numerous updates and improvements from Provinciano across all systems.